However, if the betraying by Pierre d’Aubusson yields a substantial income for the Order, he thwarts Prince Djems plans, smashing all his hopes to pieces. Duped in the most cowardly manner, having become the powerless toy of the magistrate, Zizim will be exiled in Europe for years. Djem is taken to Nice first, a city he enjoys because of its charming women and its pleasant climate, and later to the land of Savoy, where he meets Charles the First, with whom he binds and who becomes his ambassador with the young king of France Charles the Eighth ; ensues a long wandering under the vigilance of the Hospitallers through several castles of the Limousin, a necessary period for the Order to raise a prison tower, in its Bourg-neuf (Bourganeuf) commanding quarters to take in the royal prisoner. This tower is presumably protecting Djem from the possible crimes fomented by the sultan Bayezid, should forbid any military intervention by the King of France, and supposed to dissuade the son of the Conqueror from any possible escape towards an allied country. Today, in this little town in the Creuse, everything reminds one of this famous prisoner in the fifteenth century: the street, the hotel, the inn carrying his name and, still standing, the « Zizim tower », henceforth listed. Bourganeuf prides oneself on having the most important Turkish community in France, and all of its citizens, five centuries after his death, Muslims and Christians alike, worship the name of Zizim, the beloved Sultan. Djem and his loyal lieutenants and servants regain hope by the time of Louis the Elevenths death and the accession of Charles the Eighth, when the young duke of Savoy tells his cousin about the conditions of detention under which the prisoner of Bourganeuf has to live. Immediately convinced that the unfaithful d’Aubusson spread the rumour about a « sheltered » Djem, and by that misleading the prince and fooling the European sovereigns, the king gets angry, gives orders for the captivity of the Sultan to end, and specifies: « If they do not want to be forced to do so, the Order shall free the Ottoman Prince without any delay! ». Unmasked but still greedy for gold and prestige, in consideration for various benefits and a cardinal’s hat, the grand master gives up his prisoner to the only power in the world he owes obedience to: the Church of Rome, under the reign of Innocent the Eighth at that time. 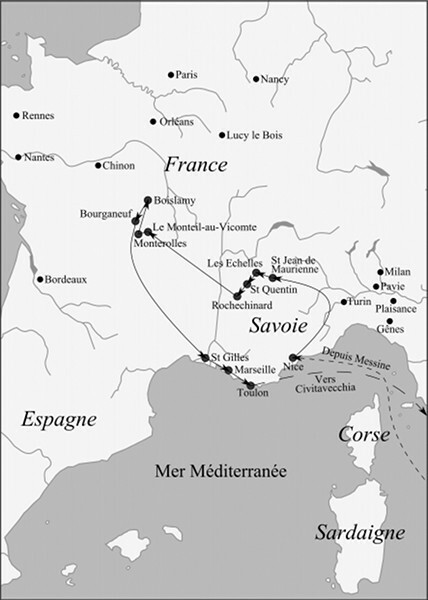 From that moment on, always followed by his loyal lieutenants and friends, walked to Italy under the highest surveillance of the royal guard and the Knights Hospitallers, Djem will become the incongruous guest of the Christ’s Vicar, unusual and permanent resident of the Vatican, and will be at stake in the most fateful intrigues. From the court of France to that of Hungary, from Constantinople to Cairo and from the Vatican tu Venice or Florence, the incessant activity of ambassadors and diplomats will rise. 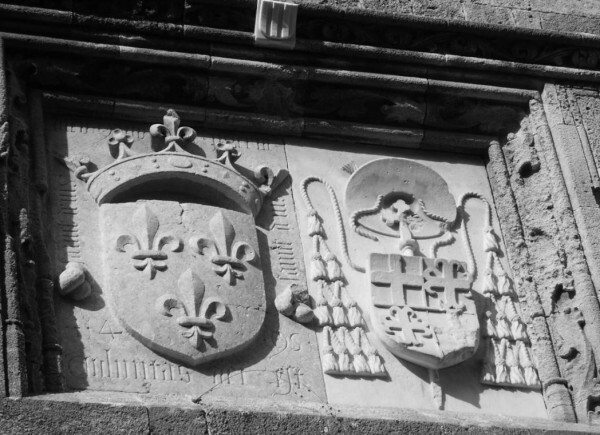 One of the decoration arms panel, in Rhodes, the frontage of the Auberge de France, One could recognize the arms of the kings of France on the left: Azure with three golden lilies… On the right, the arms of Pierre d’Aubusson, which are emblazoned as follows: Quarterly, by the first and fourth of gules with a silver cross; by the second and the third, gold with an anchored cross of gules. In the present case, this shield is surmounted by a Latin cross (lacking one arm), and a cardinal’s hat. On the tomb of the great master, which is kept in the castle of Versailles, a crown with a lily replaces the cross. The adorable will of the providence? lay his head on a cushion of thorns ? Rhodes, palace of the great masters. – So Your Highness wishes to reach the Balkans by land? Would it be too much to ask what your projects are, what means are at your disposal, and the reasons for raising an army? – Certainly Excellency. Since the very beginning of my exile, the idea of regaining my country was already an obsession, and yet fourteen months have passed since my shameful flight began. – By God, please don’t use such a term! It is common knowledge that in those circumstances, it was a question of survival! We know enough about the rules of the Empire to be aware of the « fratricidal law* », established by your father, the Conqueror of Constantinople. – This law exists indeed, however, nothing proves that my brother applied it. – Yet, as it was uncertain, I understand that you preferred not to take such a risk. We most probably never would have the opportunity and the privilege to welcome a Sultan of the Empire at our table. – It is true, even if I do not know my brother with whom I only have been in contact once as a child, I know he is capable of anything to exclude me from my father’s inheritance. Besides, I offered him to share. This would have been wise: an empire so vast is hard to control for a single man, which is why the Romans came to nominate several Emperors. – And how did your brother reply? *This « fratricidal law » forces the governing sultan to execute his brothers and nephews to protect his power and avoid any risk of overthrow. Thus, in 1595, Mehmet the Third orders his nineteen brothers to be strangled and fifteen pregnant concubines to be thrown in the Bosphorus. The law is applied until the end of the sixteenth century. After that, the brothers of the Sultan are locked for life in a building of the seraglio, where they are treated as prisoners rather than princes.